Ajax already knocked off one European power in the Champions League by taking out 13-time champion Real Madrid. Now the rising Dutch club has its sights set on eliminating Cristiano Ronaldo and Juventus. Ronaldo sat out the last two weeks after injuring his right thigh while on international duty with Portugal but is due to return for the first leg of the quarterfinals on Wednesday in Amsterdam. After finishing runner-up twice in the last four years, Juventus signed Ronaldo — who helped Madrid to the title in four of the past five seasons — to take the next step and win the elusive trophy. If ever there was any doubt, Ronaldo showed his value by scoring a hat trick against Atletico Madrid in the last 16, almost single-handedly overturning a first-leg deficit. Ajax also produced a memorable comeback in the previous round, overturning a 2-1 loss at home with a 4-1 victory in Madrid to reach the quarterfinals for the first time in 16 years. Attempting to revive the success it had in the 1990s — when the Dutch club reached two straight finals (winning the 1995 title and losing the 1996 trophy to Juventus) — Ajax relies on a large array of youth products . De Jong is already slated to join Barcelona next season, while 19-year-old captain Matthijs de Ligt is considered one of the top young defenders in Europe. Facing Ronaldo will be a big test for De Ligt. Ajax is run by CEO Edwin van der Sar and director of football Marc Overmars — both of whom were members of the club that won the 1995 title. Van der Sar later played for Juventus. While Juventus is loaded with experienced players, one of its youngest players led the squad during Ronaldo’s absence. Moise Kean, a 19-year-old Italy striker, has scored seven goals in his last eight games for club and country. 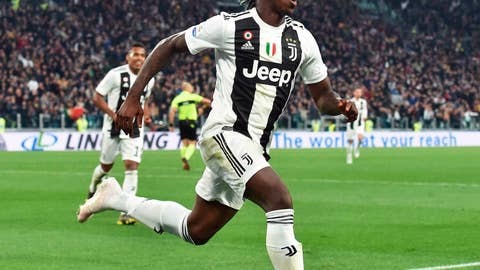 Still, Juventus coach Massimiliano Allegri hinted that Kean will likely remain an option off the bench against Ajax, having come on and scored the winner against AC Milan on Saturday.